Raaga.com: Its Drive Time-Melodies For The Road! Its Drive Time-Melodies For The Road! If we all notice keenly, car’s have always been used to convey a racy theme or even as a wonderful location to bring out the closeness of two lovers. The first song any person belonging to this generation would associate with is ‘Ennaikonjam maatri’ from Kaakha Kaakha. The beautiful chemistry unspoken in picturized in their car journey. Thanks to the jeep trend, we also saw a similar love chemistry happen in the song ‘Odo Odo Ododi Pore’n from the movie Kanden kaathalai starring bharath and Tamannah. PudhukottaiSaravana from the movie titled the same has the song where see Dhanush and Aparna Nair travelling throughout in a car. Not only these songs bring out the variety cars but ofcourse the variety of locations too. One song to prove this is ‘Poi Solla Poren’ from Thiruttupayale where we see the actors on an open top BMW car and that too in Australia!! Thanks to the fast vehicle that it is, a car as a means of transport is always used for racy title songs too. One such song is ‘Arjunar Villu, Harichandran Sollu’ from Gilli. Likewise in the movie Bheema we see all the actors on a shooting spree in the song ‘Oru mugamo,iru mugamo’. When it comes to friendship also a car of a higher end is prefereed and that is exactly what we see in Saroja ‘Dosth bada dosth’ an SUV made to look like a van, making their journey together a memorable one. 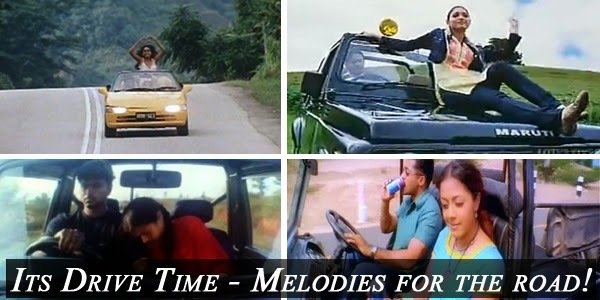 Thus a car in a song sequence has also portrayed its significance,be it a chase or a romantic duet. Imagine these songs without a car? Wonder how they would look to the audience?